Bouef Bourguignon is a favorite in our household. When I went gluten free, this was one recipe I knew I couldn’t give up. This is an easy recipe to make gluten free, the biggest thing you need to switch out is the pasta and this recipe is so good, you can’t even tell it is gluten free! My favorite part of this whole recipe is the mushrooms. Even my dad, who hates mushrooms loves these. Just proof that butter fixes anything. Preheat the oven to 450 degrees. Cut the bacon into strips. Saute the bacon in 1 tablespoon olive oil for 2 minutes until lightly brown. Put aside. Pat the stew meat dry with a paper towel and then in the same pan, saute the beef in oil. I usually saute about a third of the meat at a time. Set aside. In the same pan, saute your chopped carrot and chopped celery. Add all the ingredients to a baking dish. Add 1 tsp. salt, 1/4 tsp. pepper and 2 T. gluten free flour and toss. Put in the oven for 4 minute, then toss the dish and put back in for 4 minutes. Turn oven down to 325. Stir in 3 cups of wine or juice, 2 cups of water, 1 tablespoons of tomato paste and 2 tablespoons beef base. Add to pan, just covering meat mixture. Let it simmer in the oven for 2.5- 3 hours. Pull out of oven and drain sauce off into a sauce pan. Put sauce on stove and bring to a boil and then let simmer. Prepare noodles according to package directions. While noodles are cooking, prepare the mushrooms. Add butter and olive oil to pan when the pan is really hot and the butter frothy add mushrooms. Cook until mushrooms brown and crispy on edges. 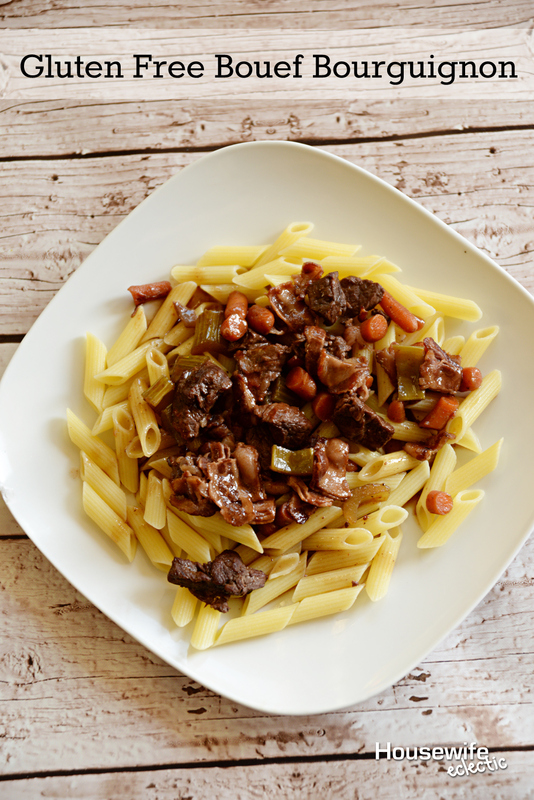 Serve Bouef Bourguignon over noodles, topped with mushrooms and its own sauces. Absolutely delicious and gluten free too! This recipe looks great. It looks like a healthier version of one of our favorites! Wow does this look delicious and like such a comfort food to make! I love these meals in the fall and winter because they really feed the soul and make the house smell super fab! This looks amazing and so delicious. I do love me some pasta. This looks like a perfect fall dish, certainly a comfort food! I am adding it to my list. I can't wait to give this a try. I love the way you made it and boy does it look good! I have literally never had this before, but have heard so much about it (originating, of course, with the Julia Childs movie with Meryl Streep!). This looks delicious and I'm going to have to try it now for sure! Oh wow, this looks amazing! Love that it can so easily be made gluten free too! One of my closest girlfriends can't eat gluten and I'm always looking for meals that everyone including her can eat when I host dinners. I want to start including gluten free foods into my diet, I imagine they make you feel a lot less bloated. Great recipe! My Mom makes this classic dish and I've always loved it. I started making our home GF for my son, and this would be a great dish to add to my recipe collection. Yum! This looks so tasty. I love trying out new recipes I find online. I'm going to make this for dinner tonight. Wow, that looks so amazing. I would love to try this recipe at home. My family would love it! I'm not big on gluten free but I love this dish with regular pasta. It is definitely a fall staple. Oh, sounds like a lovely recipe. I can't wait to try it, I want to have a gluten-free diet. After seeing Julie and Julia I was afraid to attempt this recipe, and I love to cook. It does look delicious. Maybe I'll have to give it a try. Ive never heard of this dish before. Sounds really interesting. This is one of my favorites! I haven't had it in a while but now I have to make it! I'm planning my dinner for tonight and I wish I had the ingredients for this laying around so I could make it. It looks so delicious and great for the entire family to enjoy! This dish looks amazing. My kids would definitely love this and I think my husband would give it a try too. This looks yummy. No one in my house eats beef but me! I still may have to make this! Thanks for sharing! Oh my gosh, this looks absolutely delicious!! I'm not the best cook but this makes me want to try!